Where do I begin? I have made a 2014 resolution to get busy and talk about some of the really cool things that happen around Avenue Art & Company. We are now a year and a half in our new location and we are so grateful for the opportunity to do business in this great space. Last year brought in familiar long-time customers and many new faces as well. We continue to be busy with many outside projects that involve selecting the art, framing, and installations for hospitals, clinics, offices and corporations. 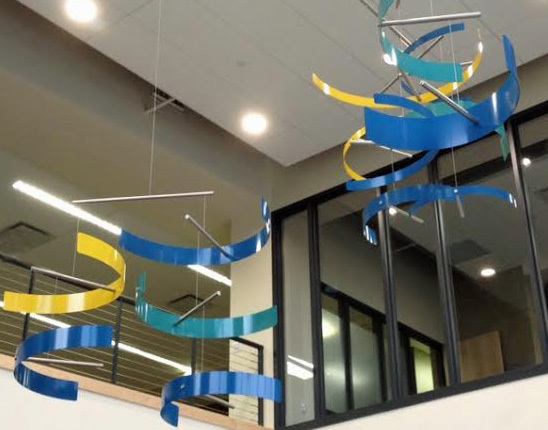 Highlights from last year included a custom mobile by Matt Richards for the new Foth building in De Pere, airbrushing original wall art at Theda Clark Hospital’s 4 South renovated patient rooms, handmade paper Tau crosses for the St. Elizabeth Foundation, and many more residential appointments. January allowed each of us to get out of the store for a little fresh inspiration. The Atlanta International Gift Show introduced Joe and myself to several new lines of handmade products, and the Midwest Art & Framing Expo in Las Vegas was packed full of new framing materials and lots of new artwork for Karen “H” and Paula to be inspired by. Getting to the shows is always a challenge but this was a great opportunity to get a dose of NEW! Stop in and see what we’ve brought into the store. New things are coming in every day! Be the first to hear about our new items, events and special promotions. Sign-up today! © 2019 Avenue Art & Company. All Rights Reserved.